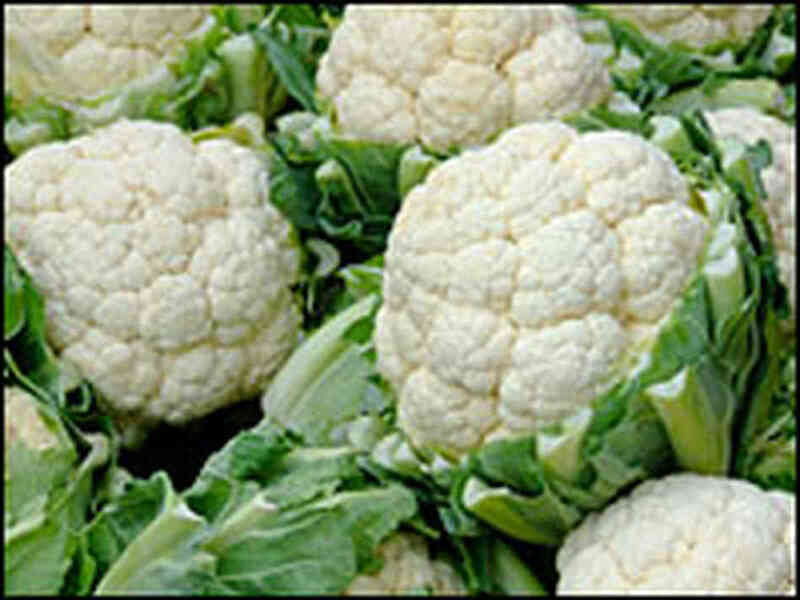 Cauliflower is a member of the cruciferous vegetable family and therefore joins the likes of Brussels sprouts, cabbage, broccoli, bok choy and other veggie powerhouses. Even though these veggies are personal favorites of mine, many people seem to dislike this veggie family, even though they have powerful antioxidant properties. So, I have made it my mission to create tasty recipes that incorporate these vegetable superheroes in an effort to spread the love – and the deliciousness. Cauliflower can grow in cool temperatures and therefore can be a staple throughout the fall and winter months at farmer’s markets and seasonal markets. So, next time you’re at your local market, give cauliflower a chance! What Do I Do With Cauliflower? Cauliflower is an easy vegetable to begin your cruciferous vegetable tasting, since it can actually be prepared to taste just like an all-time favorite: potatoes! Lower in calories and carbohydrates, but similar in consistency, this alternative can be swapped into many potato recipes! The two recipes below are kid-friendly ways to introduce your family (or anyone) to cauliflower – I promise you won’t even have leftovers! I adapted this recipe that was given to me by a friend and slimmed down traditional cheese sticks. All of the flavor for less than 50 calories per “bread”stick? That is true cauliflower power! Wash and dry cauliflower and chop into florets. Steam (either in microwave or over boiling water) until soft (approximately 10-15 minutes). 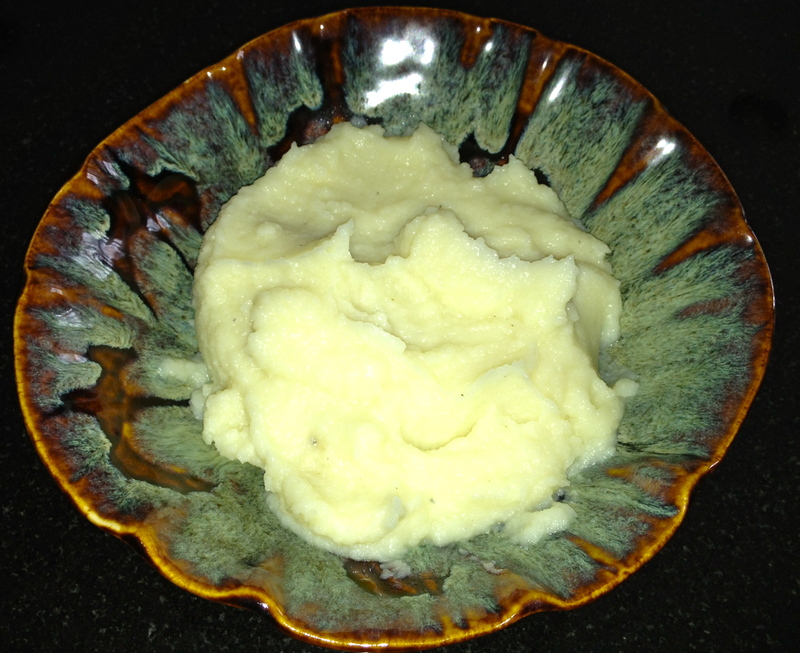 Place cauliflower in food processor and blend until pureed. The cauliflower should have the consistency of mashed potatoes. In a large bowl, mix eggs, 2 oz cheese (2/3 of the cheese), spices (garlic, onion powder, salt and pepper) and pureed cauliflower. Spray a 9×13 inch casserole dish with non-stick vegetable oil cooking spray. Transfer cauliflower mix into casserole dish and spread into a thin, even layer with spatula. Bake in oven for approximately 20-25 minutes, or until the top is slightly brown. Remove from oven, add remaining cheese on top and bake until cheese is melted (another 5 minutes). 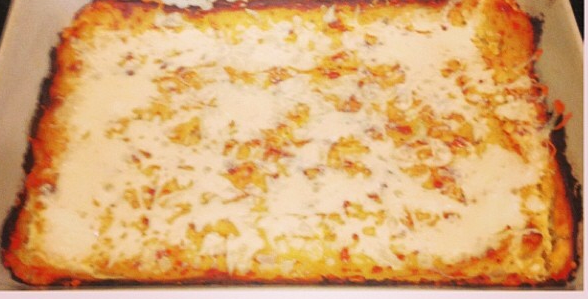 Cut into squares (3×4) to yield 12 cauliflower breadstick squares. Enjoy! This recipe is a true favorite of mine – so easy to prepare and tastes just like your favorite comfort food – only take even more comfort in the fact that it contains less saturated fat, less carbohydrates and fewer calories than the traditional potato version with cream. Wash and dry cauliflower. Cut cauliflower into florets and transfer into pot of boiling water. Boil until soft (approximately 5-7 minutes). Strain water from cauliflower and transfer cauliflower into food processor. Blend until pureed (it should be the consistency of mashed potatoes). Transfer cauliflower into serving bowl. Add butter and spices and stir until well combined. Enjoy! 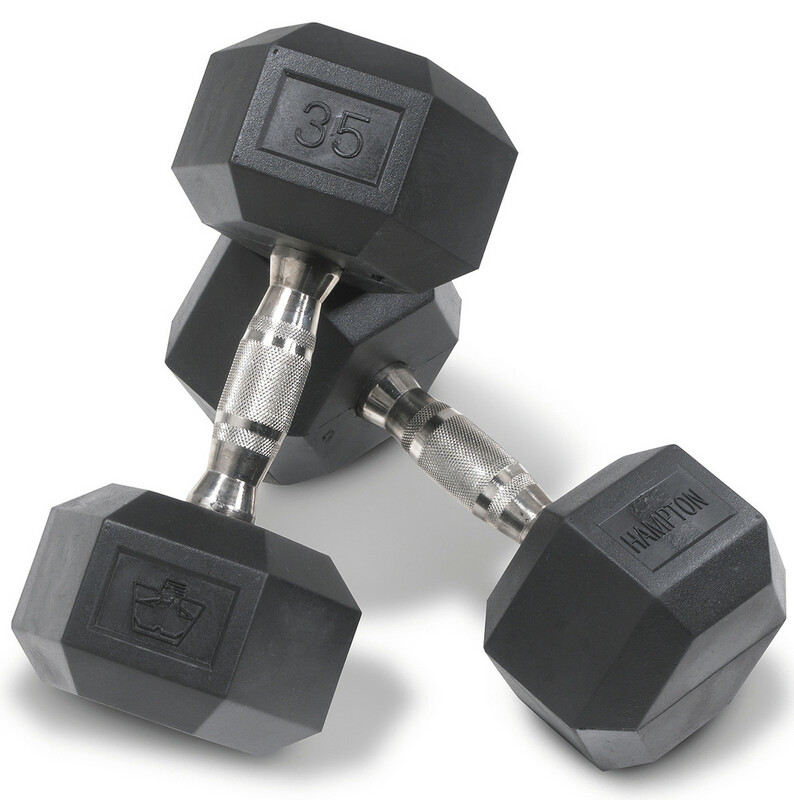 Simple Ways To Pump Up Your Workout! A lot of people tell me that they find the gym to be boring. So, I thought it’d be helpful to share some of my tips for keeping your workout fun, full of energy and effective – and keep you coming back to the gym for more! Hopefully this post will get you excited to rise and shine and move..and revive your gym routine! You know that little incline button on your treadmill? Use it! Also, ellipticals have incline and resistance buttons, which allow you to customize your workout and add in more effort – effortlessly. I like to simulate hills that naturally occur while running outside, so every few minutes I’ll add inclines throughout my run. I usually maintain a 0.5 or 1.0 incline on a treadmill as my “flat” surface to increase the effort without really running up a mountain the entire time. Then, I’ll either add timed hill intervals or randomly decide to run at a steeper incline for a few minutes. It can also be great to mix things up and power walk up a large hill (think 7.0+ incline) during your cardio session, so that you can engage your glutes more. The hill intervals make it so I don’t get bored and also, surprisingly, make the rest of the (flat) workout seem easier in comparison. Great for a mind trick, as well as your stems. So, before you call me crazy for thinking that sprint intervals are fun, try it! I personally find sprint intervals to be less monotonous than a steady run at the same pace. I like to plan my sprints either by the clock (perhaps sprinting for 30 seconds, walking for a minute, jogging/running for 1 minute, repeat) , my music (sprint for a chorus, jog/run for the rest), or where I am on the track (the treadmill I use has a touch screen that shows different sceneries – I like the track, which traces your steps with a red line so you can see how far along you are – I tend to sprint the straight sides and jog or walk along the curves). However, the term sprint is key! Think speeds around 9.0 or 10.0 + on a 12.0 speed treadmill. Increase sprint time and decrease walk/jog time as this becomes easier. Or, eliminate walking entirely and recover with a jog or a run as you train more. Instead of stepping on to the hamster wheel and dreading it, add some pep to your step and mix up your session. I try to do a 30-40 minute sprint interval session at least once a week – to keep me toned, de-stressed, and excited to hit the gym! 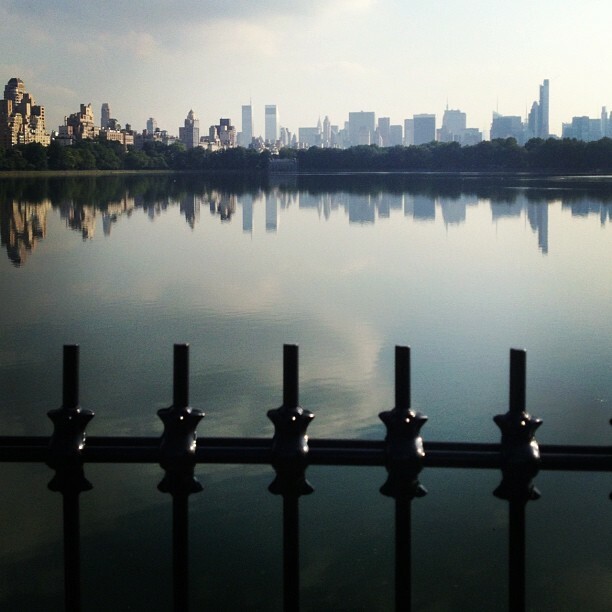 My own photo of the Reservoir in Central Park – Who wouldn’t want to run here? Last weekend felt like a heat wave, so I took my run outside with a friend. Okay, maybe not a heat wave, but here in NYC it’s been in the single digits for awhile and last weekend it was 45 degrees and bright sunshine. Although I am a self-proclaimed gym rat and typically prefer my gym sessions to any other type of workout, I was thrilled to take my workout outside and hit the pavement. Mixing up where – and how – you do your routine spices things up in your mind, as well as your body. Performing new moves adds to muscle confusion, which forces motor units within your muscles to be recruited for new tasks and neural connections to be made. If you do the same thing all of the time, not only will you be bored – so will your muscles. Running outside adds resistance from the wind and naturally occurring hills and differences in terrain texture. Also, there is no better feeling (in my opinion) than finding the perfect scenic route and surrounding yourself with nature while clearing your head on a run. My favorite spot is the reservoir in Central Park. Find your favorite running spot and leave the gym (and your boredom) at home. This is the single most important tip I can give you for avoiding boredom – and plateaus in fitness and weight. Our bodies are quick to learn movements (muscle memory is REAL) and as soon as we make those neural connections, it becomes easier to perform that task. My challenge to you is to challenge yourself. Force yourself to incorporate one new workout (whether it is one new workout per week, per workout session, per 3 workout sessions, whatever works for you!) and try it. I like to play around and discover new movements, pick up new tips from magazines or the internet, try something I learned in a gym class I took recently, or bring back old favorites that I haven’t done in awhile. Also, you can challenge yourself by trying out variations on movements that you’re comfortable with – such as performing leg lifts during a plank, trying jump squats, or doing a diamond (triceps) push-up. It’s also exciting to set a lofty goal (such as doing a 2 minute plank when you’re not used to doing them for longer than 30 seconds) and watch yourself work up to it. Or, my personal favorite – sign up for a new class, a race, or a fitness challenge. It can actually be fun to challenge yourself and afterwards, you will feel so accomplished – and sore! 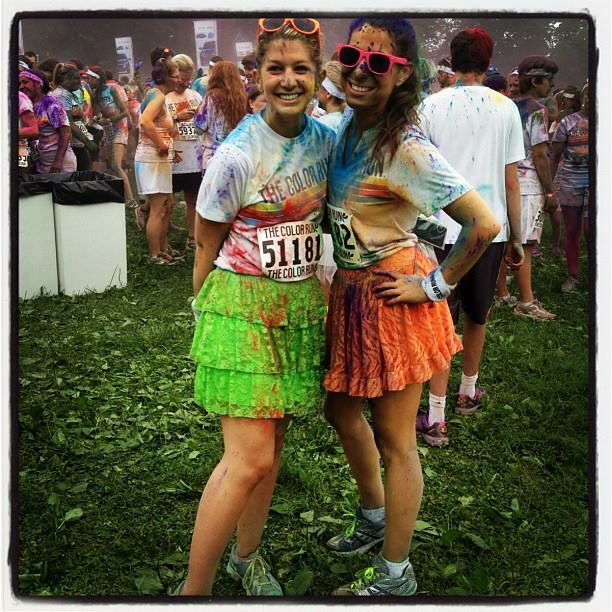 My friend Casey and me after the Color Run in Philly this past summer. Worth the three showers it took to finally get all of the paint out of my hair! I hope that you found these tips to be helpful and are excited to try out some of these ideas in your next workout! Keep checking out my blog for fitness tips – and for tips for fueling your body with good nutrition. Remember, your body works hard for you. It’s important that you treat it with respect, challenge it, have fun with it and make it strong – and happy!